Traditionally the livelihood of men, farming was not the obvious choice for Irene Pablo, a pure-blooded Mangyan woman from a remote tribal village in the mountains of Oriental Mindoro. But since taking the five-day educational seminar known as the Integrated Farming Bio-System (IFBS), Irene, 24, has broken the old stereotype by personally cultivating her family’s rice field, using the techniques she had learned from her training. The IFBS was held at a public communal building in Lantuyang, a barangay located on the slopes of Mt. 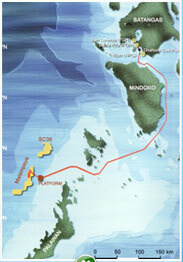 Halcon in northern Oriental Mindoro. Along with 41 other Mangyan volunteers, Irene was the beneficiary of the short course on modern agriculture, which was divided into various lectures given by farming experts from Shell. IFBS is an integrated approach to farming which advocates the maximisation of available and local resources, as well as the use of home-made organic fertiliser. The project is a joint effort of the Mindoro Biodiversity Conservation Foundation, Inc. (MBCFI) and the Malampaya Foundation, Inc. (MFI), the two groups that have been involved in implementing the sustainable development and environmental thrusts of the Malampaya Joint Venture Partners in Mindoro. After her training, Irene got involved in the maintenance of her family’s rice paddies in a three and a half hectare farm in Sitio Sungi, some two kilometres from Lantuyang. The paddies have been tilled by her father and brothers since 1992 and are her family’s main source of livelihood. Today, Irene applies her IFBS training on the use of organic fertilisers to benefit the farm’s production.